Recovery Doesn’t Happen All at Once. That’s why we only see one patient at a time. At ASIS Physical Therapy, we are happy to be your first choice for San Diego physical therapy. With the proper treatment, you can be confident that the discomfort and pain you currently experience can be alleviated and/or totally eliminated. The personalized methods of healing and goal setting we provide, combined with our advanced techniques, give you a chance to finally live pain-free again. With the help of our uniquely successful physical therapy exercises, you will get results that you can actually feel and enjoy day by day. There is no better time than now to get serious about reaching your highest potential of health again. With one of our San Diego physical therapists by your side, you can make pain a thing of the past. Fit at the Tee utilizes the latest and most advanced medical and sport-performance techniques to dramatically improve your performance. Our Fit at the Tee advantage makes some of our regular physical therapy exercises feel like a thing of the past. The Titleist Performance Institute (TPI) certified professionals at Asis Physical Therapy know the game inside and out, and know how to succeed. 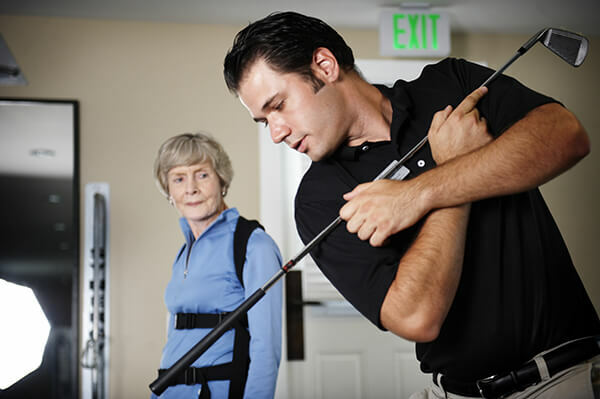 As your San Diego physical therapist, we can help you feel better, and improve your golf game! Find out more by reading about our TEAM APPROACH. Whether you want to lengthen your drive, lower your handicap, play more pain-free golf, or simply impress your friends and colleagues, Fit at the Tee Fitness and Performance programs are here to help you succeed. Reduce the potential of injury, improve your stamina, power, accuracy, and the overall consistency of your game with the help of a properly designed golf fitness program. Work with one of our San Diego clinics, in Rancho Bernardo or Pacific Beach, and the knowledgeable medical professionals, as they develop a rehabilitative-based program that uses the proper biomechanics and techniques to help you avoid injury. Find out more by reading about our EVALUATION and GOLF FITNESS PROGRAMS.